Like the rest of us, you, no doubt, expect a lot of your shoulders. They are depended upon to perform a large number of movements during your day. This variety of complex motion assists you in every area of your life - at work and at play. However, you have been overworking your shoulders if you are currently experiencing shoulder pain. That is to say, you might be participating in repetitive activities such as lifting and other arm movements, in particular those done overhead, like throwing a baseball, swinging a golf club or tennis racket, or simply setting objects on overhead shelves. Nerve irritation, joint stress, and wear and tear of the tissues surrounding the shoulder joints can take place as the consequence of these types of repetitive motions These repetitive motions shouldn't actually produce pain if your shoulder is healthy. But, if you are feeling pain in your shoulder, it is an indication that there's a dysfunction that needs to be corrected. Shoulder muscles frequently become tight, and even weak, if the nerves are irritated, and movement is painful and restricted. This often takes place in the ligaments and a group of muscles (and their tendon attachments) referred to as the rotator cuff. These muscles and tendons join your upper arm bone with your shoulder blade and also help secure the ball of your upper arm stably in its shoulder socket. It is the result of this elegant combination that permits the greatest range of motion of any joint in your body. 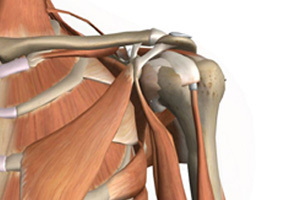 The severity of this shoulder impingement syndrome can extend from a slight "catching" pain upon motion (especially raising your arm overhead), to an almost complete loss of ability to use the shoulder. Never either disregard your shoulder pain or continue an activity while in pain. It is crucial for you to see a health professional about your shoulder problem as soon as you can because the pain will only go from bad to worse. Unhappily, if disregarded, some shoulder conditions, such as Rotator Cuff Syndrome, many time end up needing surgery and an extended rehabilitation. Your chiropractor knows exactly what to do to relieve your pain, and is a specialist in diagnosing and treating muscular-skeletal problems. Because chiropractic care focuses on the reason for your shoulder pain, it is treated at its source. Romo Chiropractic will assist in restoring healthy mobility to your shoulder joints, and will also talk to you about rehabilitation exercises that will not only help you get rid of the shoulder pain you have now, but will help you to avoid shoulder injuries in the future.